Click the buttons below to access resources for the presentation. Interpreting in an educational setting has specific challenges because students are in a process of learning about their world and how it is best navigated. 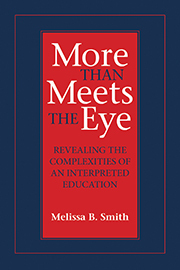 For students who receive their education, through interpretation, there are special considerations necessary for how to make the classroom experience successful. This workshop focuses on specific strategies can employ to foster student growth and development within a classroom. Working from the notion that incorporates both linguistic and social aspects, we will focus our discussions and activities on effective interpreting practices that promote the development of literacy of the students with whom we work. List at least 5 resources for continued professional development. Each of the titles in the list below is a link. When you click on the title, it will reveal a series of resources contained in that category. Here are resources related to Narrative Skills – as some towards understanding other discourse genres as well. Another suggestion for developing social literacy is including the student as an assistant teacher in ASL instruction for their peers. For some students who are hard of hearing or use a cochlear implant, it may develop a higher regard for the use of sign language and provide a greater benefit for having an interpreter as part of the educational team. Additionally, it can help provide a role for the student that needs to focus on taking turns within the activities and clue students in to the ways that people need to wait for their turn. This is a presentation by Dr. Ben Bahan at StreetLeverage in Fremont, California in 2016. The video of the presentation is presented as well as an English translation. Though it takes more time to watch the ASL, I would recommend it is worth it to see such an excellent example of Academic ASL. 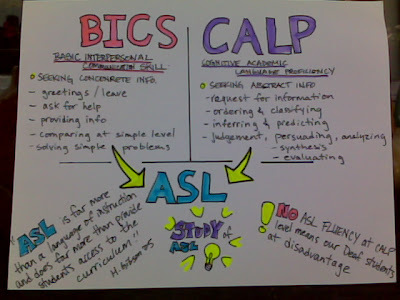 This article shares research about the impact of the age of acquisition of ASL for students. Importantly, it points out that early exposure to ASL is a benefit for both signing skills, but also cognitive development – which supports the acqusition of speech skills as well. The bottom graphic demonstrates what is often attempted for Deaf and Hard of Hearing students – which in part explains such poor results. ASLized.org: This is a site designed to the promotion of ASL and provides ASL texts in a variety of genres. See the Mirrored Math resource. John Brooks, a Deaf math teacher from San Diego, explains how to do a number of different problems and processes in ASL. First of all, for the context of the interpretation: I had seen the video once before all the way through and had helped prepare the lesson so I was familiar with the pattern blocks and their usage in a geometry lesson. I have also interpreted similar lessons in an actual classroom, so that familiarity was of great benefit for feeling ready. In doing my analysis, I watched it with no audio so that I could focus in on my own work, without the interference from the spoken English. In thinking about the features that I saw in my own work sample, I have a couple of large overarching items which stand out – one focused on classroom management and interaction between teacher and students. The other focused on the content which is being taught. In terms of classroom management, as we have been discussing in the course, the IRE structure is very present in this interaction and I was striving to try to make it clear of how. When it started, I felt that I was a little bit stuck in first gear. Working too fast to try to fit everything in. Some of my initial fingerspelling was too rapid (which we’ll talk more about in the next module) mostly based on my trying to manage that interaction and be sure that I was able to get in the teacher’s evaluation. There was some repetition on the teacher’s part, and I wonder, in hind sight, if it would have been better for me to reduce some of the repetition to slow things down at first. In terms of the content of the discourse, the most significant piece for me was effectively using space to convey the ideas, both in terms of the process of creating patterns and in terms of discussing the geometric shapes. As mentioned before, one advantage I have is my experience interpreting in classrooms where pattern blocks are used, so I was able to quickly visualize both the shapes themselves, and the creative ways that students use them. I also tried to have a variety of different spatial maps in a variety of orientations. While in class, I would have relied a lot more on the “Vanna White” model of interpreting i.e. pointing at the overhead to show the shape, without that, I felt the need to re-create the shape. It made for a more busy interpretation… (perhaps I was in second gear by then) but I think that the use of space really helped. For example, on the description of the regular hexagon, I think the repetition in the interpretation of the sign “equal” in all the same spots where I had showed “sides” was a relatively effective way to show that concept. One spatial construct that I wish I would have done differently was at the end, when she gave directions that students could work as partners to create a joint pattern or as individuals to create separate patterns, my interpretation of both options occurred on my non-dominant side in the same spatial set-up. Given that this was a contrast – I think it would have been more effective for the spatial set-up to happen on the left and the right so the students would have seen more clearly that they had two distinct options to choose from. There is much more in this work to consider, but for the purposes of discourse, I think those two main points are the ones which are most important to reflect upon. This was filmed for another project, but is an example of a very skilled Certified Deaf interpreter who is an expert in health care talking about similar physiological processes. Here’s a list of articles that are relevant to the topics discussed in the workshop. Bowen-Bailey, D. (2015) New Paradigms for the Interpreted Classroom in RID Views. View the Ph.D. Dissertation this book is based on here. Dr. Smith did a lecture at Gallaudet University on this topic. You can see all of the presentations archived by Gallaudet University Regional Interpreter Education Center here. This chapter by Betsy Winston lays out the limitations for rigid understandings of interpreting in classroom settings. Winston, B. 2004. “Interpretability and Accessibility of Mainstream Classrooms,” In Educational Interpreting: How it Can Succeed. Gallaudet University Press. See the article. Dr. Oliva is the author of “Alone in the Mainstream” sharing her experience as an “only” going through mainstreamed settings – as well as some of her research about other deaf people who went through the mainstream in a similar way. An article on Street Leverage. Check it out. An article on StreetLeverage. Check it out. This is an article from Cindy Huff, a teacher of the Deaf/Hard of Hearing, about a framework for assessing if students are at a developmental level appropriate for benefiting from an interpreted education. The link below has a presentation in ASL about the Common Errors of Young Children Acquiring Sign Language, helpful information in seeing what is normal language development. By Bernhardt E. Jones, Ed.D., C.S.C. Conflicts can, and do, occur when it is unclear as to the interpreter’s role at any given time. This function changes during the day, especially in the lower grades. I am suggesting (as has Winston) that the title, “educational interpreter” is too narrow, and, in fact, this position is a multi-faceted responsibility. If this is true, how do we separate the roles? How do we define what it is that we do and when? A year ago Winston (Views) did a fine job in delineating educational interpreting responsibilities into three roles: interpreting, tutoring and aiding. Since then, Winston has discussed the notion that consulting is also a role that educational interpreters play. Consulting may be a new area that you had not considered before. But, think about all the times you have given your input in the school situation. How many times have you talked to parents? How many times have you explained “deafness” to others in the school? to students? to administrators? to regular education teachers? You may find that this list is long. Go to the dictionary or, better, go to the Web and search the word, “consulting” or “consultant” and see what you find. Do you fit into this definition during part of the time you are working in the school setting? The public school educational interpreter is viewed quite often as a paraprofessional and, in fact, is categorized that way in many states. However, we can make the case that, although the interpreter does perform many of the duties of the paraprofessional, she/he also performs a duty that is quite different and requires separate and distinct knowledge and skills: interpreting itself. Are we not, then, more than an educational interpreter? Might we be, to use a term that Winston has expressed, an “Accessibility Specialist?” I don’t want to confuse the issue with additional terms for us, but think about the variety of tasks you perform. Perhaps we are not “just the interpreter,”but we are more than the interpreter. Take a look at your day (or week or month, if you would like). Make a list of all the duties you perform. Try to think of everything that happens in your job. What do you do? How long do you do it? Make the list as long and comprehensive as you can. You should have a collection of everything you do. You may be surprised to see that you do quite a bit for the school and the students (both deaf/hard of hearing and hearing). Note: The graphic has been updated since the article was written so it does not perfectly correspond to the article. The next step is to draw your own windmill and categorize the duties/tasks that you have listed. Interpreting will include anything you do in the role of an interpreter. Tutoring will include all the tasks you do within that context. Aiding is a large and varied area or responsibility. Think of all the things you do in an aiding capacity. As discussed above, consulting is also an important role of the educational interpreter. Isn’t this appropriate? A windmill spins in the wind and must be flexible (accommodating) in order to operate effectively and efficiently. If one of the blades is broken or damaged, the windmill will not operate properly. Are we like that? I suggest that we are. With this model we can delineate our roles. When we are able to do that, we can better understand why dilemmas cause conflict. Conflict arises when we are not sure on which blade to categorize our dilemma. We are better able to handle conflict if we know the rules by which to address the conflict. When conflict arises, we know where it fits and, therefore, we know how to respond (how to “spin” our windmill). [I guess it depends upon who is blowing on our windmill.] The blades of the windmill can be viewed as contexts. When we know the contexts, we know the rules. This is where the Code of Ethics has caused us concerns. When applied to the interpreting blade (role, context) of the model, it is easy to understand the importance of the Code and to adhere to its principles. When we apply those same criteria to the other blades (roles), it becomes cloudy and appears to conflict with the role. The problem is compounded if other professionals do not know our contexts and/or confuse our contexts (roles, blades). We then can apply the “educating others about our role(s)” principle of the Code by explaining our contexts and the roles to others on the educational team. The other members of the educational team will not realize this by themselves. We have a professional obligation to educate our fellow professionals. By doing so, we will be viewed as professionals. This is only the beginning. When we understand which role we are working within, we can start addressing bigger questions in our field. These questions might involve questions of interpretability in the classroom, accessibility to content, an interpreted education. These questions impact our windmill and, therefore services to students who are deaf and hard of hearing. Dr. Brenda Schick, the co-creator of the EIPA, along with Boys Town, created a series of guides for the Laurent Clerc National Deaf Education Center. TASK12: This is the organization that led to the development of the Training in Public Schools (TIPS) module. The project serves 14 states and provides both training and assessment with the EIPA. The Minnesota Transition Guide for Teachers of Deaf/Hard of Hearing was created as a pilot project for the school year 2012 – 2013. It is meant to give guidance in the area of transition for Deaf or Hard of Hearing students. View Transition Guide. PEPnet: An organization focused assisting Deaf and hard of hearing students in their transition to post-secondary education. They have a module, Map It!, that is designed as a support for students in the transition stages. Click here for more Research Briefs from Visual Language and Visual Learning Center at Gallaudet. Discourse mapping is a term used for both the process of analyzing texts in interpreter education and skill development and the features of an interpretation that use linguistic features to create a connected and cohesive product. These resources are related to both doing the analysis and being able to create more effective discourse mapping in your work. This is a packet that takes you through a step by step process for doing discourse analysis. This video series features a Deaf woman and a hearing man talking about their experiences canoeing in the Boundary Waters Canoe Area Wilderness. There are 6 parallel talks in this topic in the following genres: narrative, procedural, explanatory, hortatory, and argumentative. Miako Rankin, from Gallaudet University, did a workshop on Depiction that provides a good framework on how space is used, how classifiers are incorporated into that, and how depiction of action and conversation is an important framework for helping to understanding the mapping of space and discourse. For the grant project that I am working with the CATIE Center on, this is a real focus for me now – looking at evidence-based practices for how we actually learn. Here are the two books that I am finding extremely helpful. by Brown, Roediger, and McDaniel Published in 2014. Effective learning is spaced out. (Waiting a week and then testing yourself to try to see if you remember the information – using techniques like flash cards to make yourself try to remember – and then checking to see if you did accurately.) It is the trying to remember that actually helps establish the neural pathways which allow you to retrieve information for use. Effective learning includes reflection, elaboration, and generation. Reflect: look back on what you studied and think of how it connects with what you already know; elaborate: make connections to other concepts you use and see how the ideas can be tied together into a mental model; and generate: imagine how you would apply the concepts in future scenarios. Effective learning uses dynamic assessment. This includes frequent and low-stakes assessment – like quizzes that both help you know where you stand and also force you to try to retrieve information. Research shows that this is much better time spent than re-reading or re-watching texts. I really suggest that this is a book worth reading – to help you learn some powerful tools – and perhaps even more importantly, to be motivated to try some of these new techniques because research also shows that though they produce good results, people sometimes prefer what is familiar because it feels easier and gives the illusion of knowledge. You might feel like you are learning things more quickly using strategies like re-reading a text – but the reality is that it won’t stick. by Daniel Kahneman. Published in 2011. System 1: Our automated brain that is the “thinking fast” part of how we deal with the world. This is a system designed to make connections, fit information into a cohesive narrative, and jump to conclusions. It also sometimes fools us and makes serious mistakes because of a number of biases that are built into the process. System 2: This is the part of our brain requiring conscious effort and is designed to be a check on system 1. This is the “thinking slow” part. Kahneman lays out a number of psychological experiments that have demonstrated how these two systems interact and how we sometimes get caught up in thinking errors because we believe we are making decisions solely with our system 2, but that they are often influenced by our system 1. From their web site, you can contact Robyn Dean for the latest information. It is important to recognize that understandings of the Demand-Control Schema is not static. Dean & Pollard are continuing to refine the application of DC-S so be sure to look for the most up-to-date publications and materials. 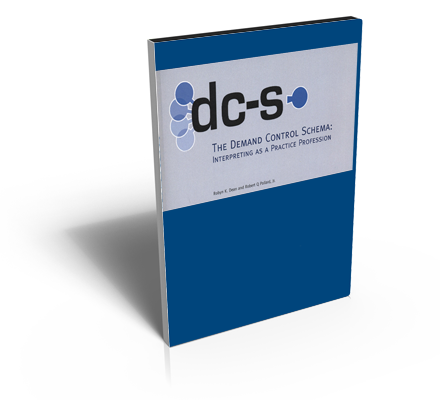 The latest article from Dean and Pollard which contains the most updated formulation of the Demand-Control Schema in an article format. Dean & Pollard, 2012. Context-based Ethical Reasoning in Interpreting: A Demand Control Schema Perspective. The Interpreter and Translator Trainer, 5(1) 2011, 155-82. You can access more of Dean’s publications here. Robyn Dean did a series of webinars in 2014 for the MARIE Center as part of the NCIEC. These are presented in spoken English with captioning and ASL interpretation. Facebook: get updated information here. Observation-Supervision: Here’s a blog post from Robyn Dean about the important of developing these groups for observation-supervision. Text Book: In 2013, Robyn Dean and Robert Pollard published a textbook on Demand-Control Schema. You can order a copy here. Rest, J.R., Navarez, D., Bebeau, M., and Thoma, S.J. (1999). Postconventional moral thinking: A neo-Kohlbergian approach. Mahwah, NJ: Lawrence Erlbaum Associates. Thanks to the organizations who helped to make this workshop possible.